petit main sauvage: Did you really think I wouldn't? Did you really think I wouldn't? I couldn't help but notice that no-one commented to my latest planning post. The one in which I told you about my continuing interest in making one-piece outfits. Of course, that may have happened because the post wasn't very interesting, or because there were more pressing matters to attend to. 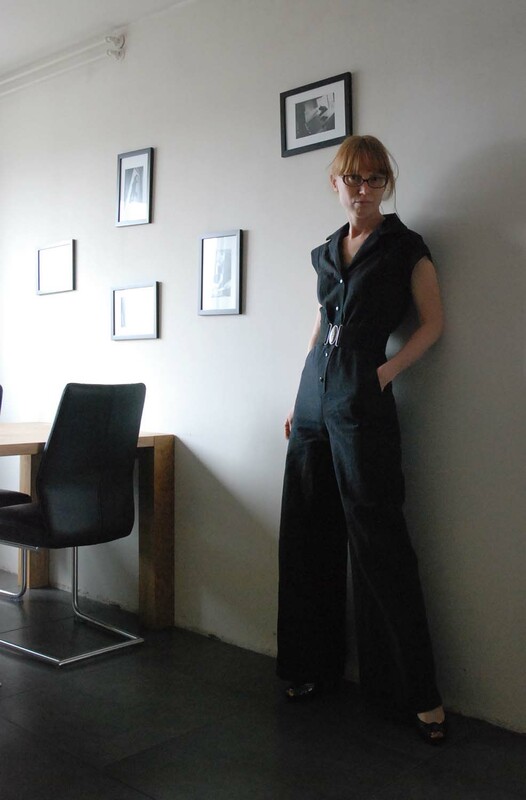 But maybe, just maybe some of you thought that, if ignored, my crazy love for jumpsuits might just GO AWAY. It has a long, wide legs, a seam at the natural waist, front and back pockets, a convertible collar and short band/cap sleeves. 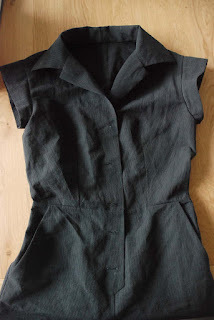 As such, it's quite a different creature than my beloved winter jumpsuit and I'm happy to announce that I got rid of the flaws which made my first one, the high-summer playsuit, pretty much unwearable. And this time, I didn't forget to take some pictures of the details. This is the front. And back pockets. 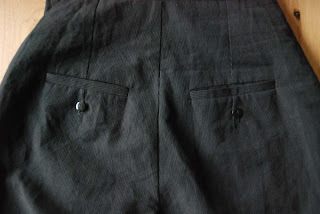 Single welts with buttons. Oh, and this is a garment which I think seriously looks as good with or without a belt. Well done, it looks amazing! The fabric has a lovely drape- linen? 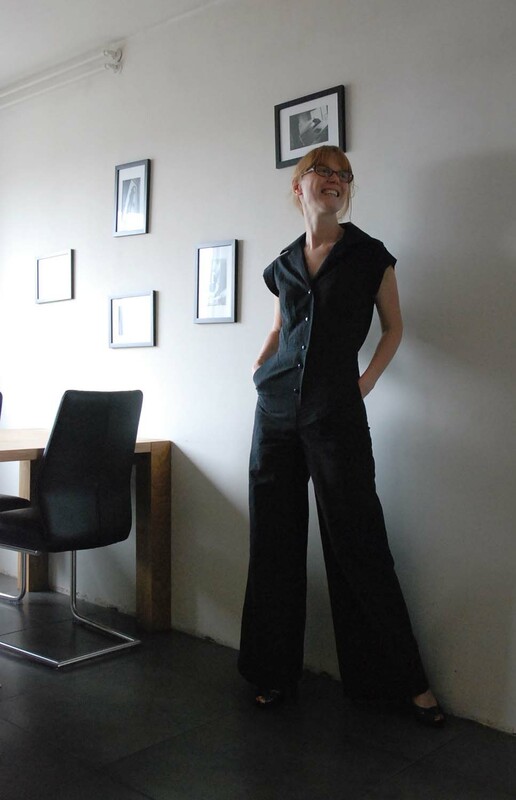 I've alway loved jumpsuits and wore them a lot when I still lived in Europe. However, I moved to the Philippines many years ago. Unfortunately here the cleanliness of bathroom floors are often not up to par, and the height of the doors also leave much to be desired (Filipinos are generally quite short!). So I stopped wearing jumpsuits, as having to take the whole thing off every time I went to the bathroom at work, and keep it all off the floor and make sure I was not showing too much underwear when I stood up, was just too much effort! Love your jumpsuit though! I hate jumpsuits - usually. Yours looks chic as hell, though. I'd wear it in a heartbeat. 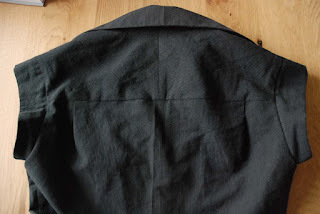 I second the question about the fabric: What is it? I love jumpsuits - for the same reason I love dresses. You put one thing on and you are dressed! No blouses to tuck in, etc. great job! I've detested wearing jumpsuits since my childhood (and hated already as a child how you have to get almost totally undressed when you go to pee... :)), but yours looks so cool and flattering! This is rad. Reminds me of a Rosie the Riveter coverall, but you know, urban & cool. You look great in your jumpsuit! It's a difficult look for most, but it looks great on you. Happy wearing! Love it! I just made a romper (blog post here http://seamstresserin.blogspot.com/2012/05/bringing-back-romper.html) and am planning on making a pants and sleeves version soon. I've certainly been inspired by seeing your jumpsuits. I love jumpsuits and I think this one looks awesome on you. Jumpsuits are so chic yet so simple. Bravo lady, BRAVO! Great looking jumpsuit! I have always liked them very much. This is a very "smart" looking jumpsuit! I love them, personally--like an entire tailored outfit in one. I love the cap sleeve treatment--beautiful shaping! Great looking and as always the fit is perfect. Very nice. How did you achieve the front button extension? Do you have an illustration of the pattern anywhere?